This week’s photo prompt is provided by Enisa. Thank you Enisa! My pulse quickens. My throat seems instantly dry. Nervousness is my condition. I hesitate to even hesitate. My eyes widen as the dark man flows down my alley, ever closer he comes. “Fortune tellers.. I am trusting a lady whom spirits discuss the living. Maybe I’m crazy.” Myself turns on me. I see his gaze upon me. His eyes the midnight sky. He fades into the shadows. 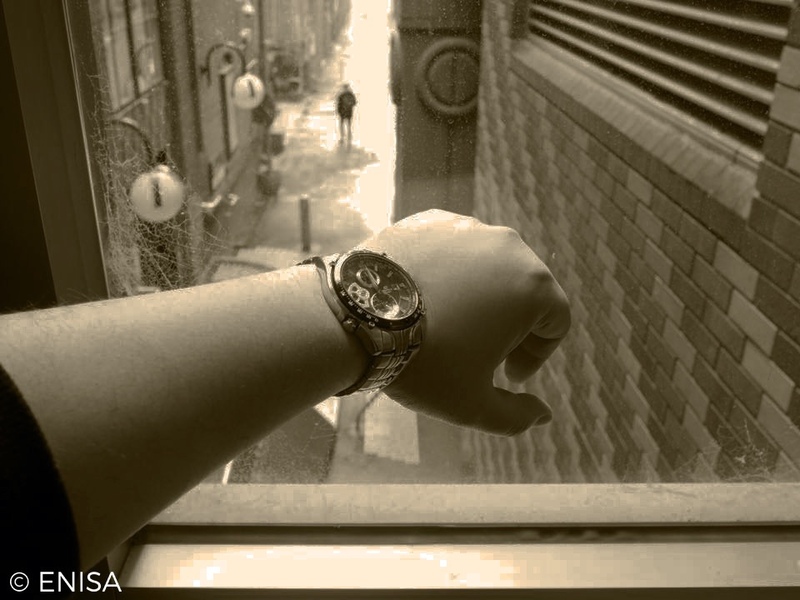 I look again at the watch. His cold hand touches my right shoulder. I struggle to walk. My body on the floor stares up at me. Never a chance to say goodbye. The man with no discernable face beckons me away. “There it is!! The end of the rainbow! 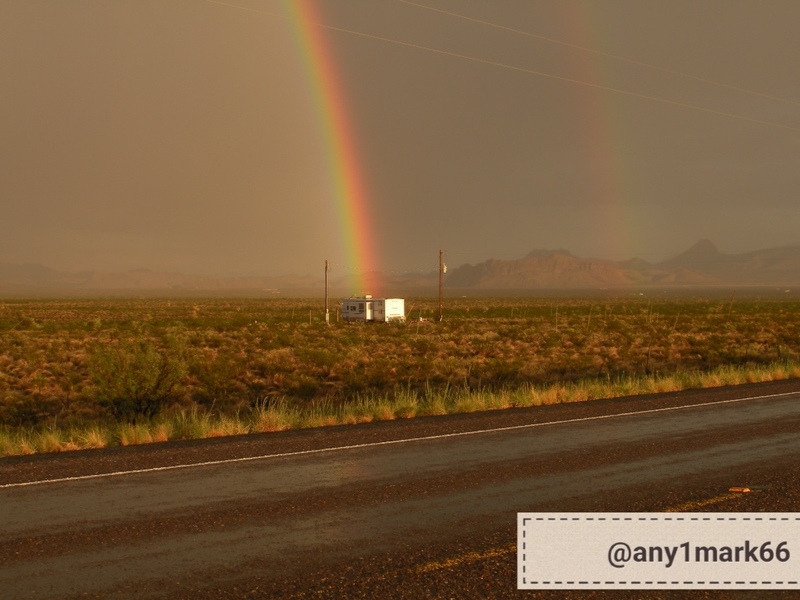 There’s a pot of gold in that trailer!” Mickey screams and flails his left arm toward the aluminum leprechaun. As the car stops, the rain thins. A strange rustling crawls through the tufted grasses. “See there are no people out here! Just us and some rain. It doesn’t even look occupied over there, Mickey.” Dad turns back to look at his son. A sudden sense of wonder comes as the roadway dries in front of his eyes. “Daddy! He is waving to us!” Mickey tugs at his dad. The sound of their car driving off goes unnoticed. Soon they will find out how the leprechaun gets his gold. “The Devil’s pocket watch had no hands.” Parson Dubois whispers to the pale breeze. His eyes look for the passage of time or life…Or anything. His wooden bench testament of a barn no longer in use. Much like the rest of the dozen buildings long abandoned that make up Destiny. His world of three dusty rows mistaken for streets. His mind places people about the store fronts. Ghosts of days gone by. Horses tied to posts. A wagon left half way between coming and going. Sounds of children ring out. Ladies in long dresses meander past lost in conversation about their neighbors. The church bell clangs behind him. He jumps up to answer. His hands part the brown faded doors. The empty rows of pews lay sleeping. A simple dias with an open book holds service to a lost cause. Yet behind a partial wall there seems to be life. His stands fast in the middle to gaze out among his missing flock. He knows no-one should have gone past him. His company creates a mystery. Even the ghosts have departed these parts. From a corner jumps a ten treat old Reggie Whitener. His Amish hat just about swallows his head. His smile lights up the room. “I waited till I seen Mr Miller..just like you ask of me!” Reggie stands like he is ready to run and chase the wind. He gives into the scene. Voices fill a previously empty church. Parson Dubois wipes his eyes of the flow of tears. He is smiling for first time in a long time. His back remains to the church. His pulse kicks up a notch causing a hot flash. He turns to hear an angel’s voice calling the assembly toward the light. Standing together six and thirty begin to sing. Each face lights up with a soft glow. They all gently sway side to side in rhythm of the hymn. One last beacon of hope from the ashes blown around for a generation. “You have all come back to me!” he leaves a careless laugh to his words. The breezes blow past. Through the windows a world grows dark. The faces smile brighter. “It’s time you came home with us.” They collectively sing. Parson Dubois falls sidewise on the bench. His pocket watch no longer needs hands either. This is from Spillwords.com… They have been gracious enough to accept my works. Give them a try. 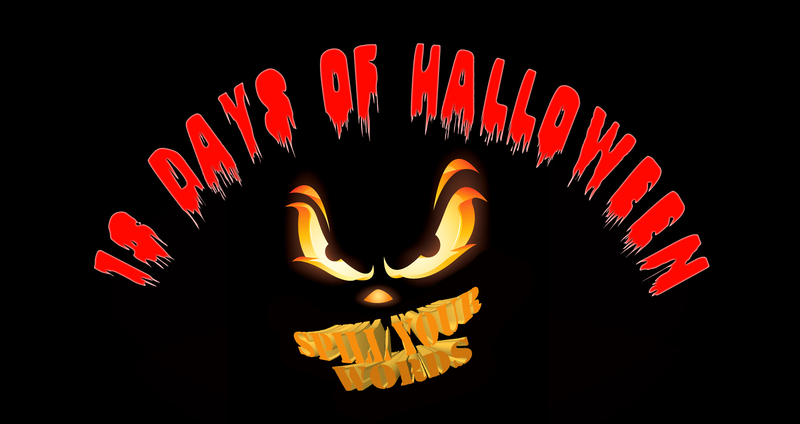 Fill out the form below to submit your literary work for consideration to be published as a part of a series called ‘13 Days of Halloween‘. The series will run from October 18th through October 31st, and we will be featuring a different literary work everyday for 13 days. All literary pieces should embrace Halloween, and the spirit of this holiday. It should make reference of Trick or Treating, ghosts and goblins, black cats, superstitions, or any appropriate iconic Halloween character. We look forward to your literary treats! My time has come. You’ve spent eons trying to understand me. I have wrote my messages in blood, white chalk, paint and tried digital for awhile. The whole was “the End is near”. With humanity it always was. Every sense of fear created conquest, war, famine and death. My saddlecloth changes and your names do, as well. In my bid adieu, I cast the last light upon the end of your path. My nature is much that of your languages. The ability to redefine what it is the I may be. In a final attempt to reveal the truth, I appear as I should to your modern words. You may not look upon my face, lest you may remember my true name. Your time for heroics past. Like your history and adherse to the myths of belief, you will rise into the air as dust. Farewell. My efforts to teach you the importance of tomorrow and banding together have failed. Tomorrow, finally will come. Remember how you wanted to live your last day. It’s close. His eyes walked up and down then side to side across the velvet dress. Her face wrapped in a scarf of blue clouds. Still he knew. His troubled mind knew. His nose wrestled to keep the scent from being taken in. His ears could create her voice in the wind. Her presence was’ll disconcerting at best. “Not all dreams are created equal. You can not ignore men as I am no more than what you made me.” A coarse soft whisper rasps Clancy’s ears. “Go away! Go away! You’re not real!” Clancy spins in his dark room. Eyes wide searching for her shape. Nerves taut. Chill of icy fingers brushing softly against his back. “You’re just a nightmare! No, no…..no more. No, no … no less. A bad dream. Charlotte! Be gone!” A frail silhouette waves at the darkness. “Years that fall through cracks in days fashioned us. You call me by a name.” She reveals her face with the features of all his loves unknown. Another night in which our monsters return. Clancy’s ghost settles into his mind for another night.